A nine-part docu-series. 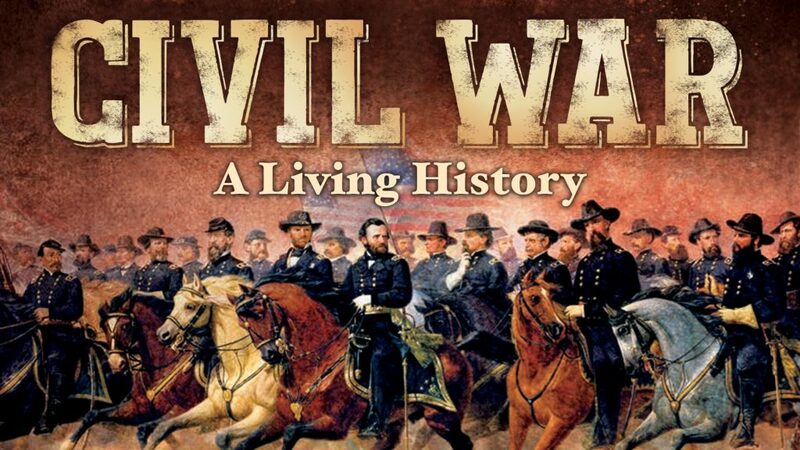 The complete story of the American Civil War; Civil War: A Living History takes viewers to the battle line to see the action from the soldier’s point of view, as well as addressing the political and personal factors that played a role in the war. Episode 1: Our Peculiar institution – In the decades before the Civil War, anti-slavery sentiment sparked an abolitionist movement that employed risky and radical tactics to bring an end to slavery. Episode 2: Rally Around The Flag – On December 20, 1860, shortly after Abraham Lincoln’s victory in the presidential election of 1860, South Carolina declared its secession from the United States and, by February 1861, six more Southern states had adopted similar ordinances of secession. Episode 3: Scott’s Plan – The Anaconda Plan is the name applied to a U.S. Union Army outline strategy for suppressing the Confederacy at the beginning of the Civil War. General Winfield Scott proposed the plan that emphasized a Union blockade of the Southern ports and called for an advance down the Mississippi River to cut the South in two. Episode 4: Rebels At The Gate – In 1862, Union and Confederate armies faced off in two of the bloodiest battles of the Civil War – Shiloh and Antietam. Episode 5: We Are Coming, Father Abraham – The initial war fever soon dissipated in both the North and South and each side was compelled to resort to conscription. Episode 6: Lee’s Masterpiece – The Battle of Chancellorsville, fought from April 30 to May 6, 1863, is widely considered to be Confederate Gen. Robert E. Lee’s greatest victory during the American Civil War. Episode 7: High Water Mark – The Battle of Gettysburg, fought from July 1 to July 3, 1863, is considered the most important engagement of the Civil War. Episode 8: General Grants War –The Battle of the Wilderness marked the first stage of a major Union offensive toward the Confederate capital of Richmond, ordered by the newly named Union General-in-Chief Ulysses S. Grant in the spring of 1864. Episode 9: The Butcher’s Bill – The Battle of Kennesaw Mountain was fought on June 27, 1864, during the Atlanta Campaign of the Civil War.